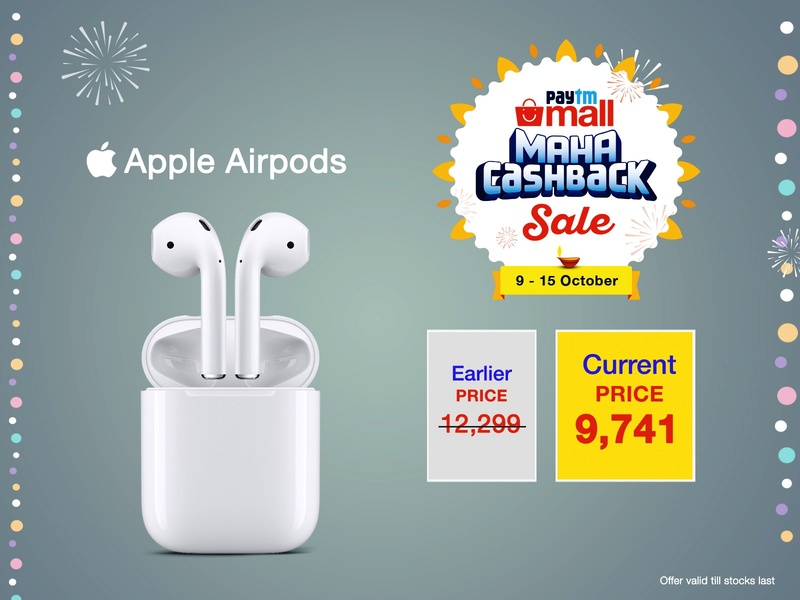 Home accessories apple airpods apps and softwares gadgets and appliances Paytm PayTM mall paytm mall maha cashback sale Apple AirPods @ Rs. 9,700 Only On Paytm Mall’s Maha Cashback Sale! Apple AirPods @ Rs. 9,700 Only On Paytm Mall’s Maha Cashback Sale! Apple AirPods are powerful wireless earphones that give you unbridled access to music while being on the go. With Paytm Mall’s ongoing Maha Cashback Sale from 9th-15th October, you have the opportunity to avail the device at a bargain price of Rs. 9,700 effectively. Designed by Apple, AirPods come with their own mix of comfort and convenience driven by its ergonomic design and high-powered backend system. The Bluetooth-enabled device boasts a futuristic look and has further been equipped with motion- and speech-detecting accelerometers, dual optical sensors, and dual beamforming microphones. Using the same, AirPods can automatically switch themselves on and off based on the user proximity, while seamlessly transmitting the highest quality audio during calls via its microphones. They can also sync with iCloud and seamlessly connect to a user’s Apple devices (such as iMac, iPad, MacBook, smart watches, etc.) around. Its charging case gives an uninterrupted 3 hours of playback time by merely plugging in the AirPods for 15 minutes. Collectively, the wireless earphones with charging case give more than 24 hours of playback time and up to 11 hours of talktime to a user (up to 5 hours of listening time and up to 2 hours of talktime in a single charge). Paytm Mall is offering the power-packed device with a flat 3% discount, 20% cashback, and an additional 10% cashback on ICICI Bank’s Credit and Debit card transactions. 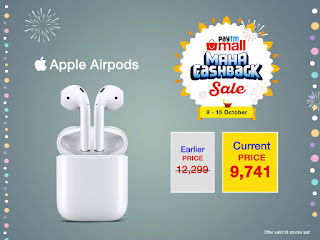 So, you can effectively purchase Apple AirPods at just Rs. 9,000 under its ongoing Maha Cashback Sale. By doing so, you will also stand a chance to win Renault KWID, iPhone XS, Gold Coins, and more gifts as part of the festive sale. The deal is simply too good to resist at this price point. But the offer is only valid till stocks last. Log on to Paytm Mall now!